Demonstrations to protest racist police killings and to assert “Black Lives Matter” have continued strong throughout the United States since the Dec. 13 national march in Washington, D.C., and the massive march in New York the same day. Protests have taken place in many other cities and towns, large and small. Walkouts, die-ins, road closures, traffic stoppages, town hall meetings, rallies and other forms of protest have occurred daily across the country. 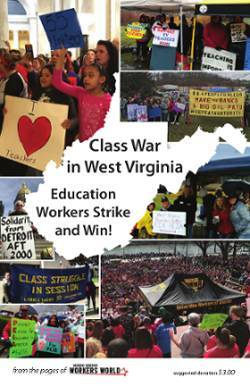 Here are reports from Workers World activists in several cities. In New York City, hundreds of anti-racist protesters confronted a small group of pro-New York Police Department demonstrators on Dec. 19 in front of City Hall. Built as a “#BlueLivesMatter” demonstration, the mainly white, male racists wore T-shirts with the slogan “I Can Breathe.” That was a racist slap in the face to 43-year-old Eric Garner, whose last words — “I can’t breathe” — were heard repeatedly by millions on videotape before he died after being put in a chokehold by cops in Staten Island on July 17. A grand jury refused to indict the police who killed him. The multinational, youthful counterdemonstrators got right in the faces of the racists, separated by a barricade, chanting “Eric Garner, Michael Brown, shut it down, shut it down!” and “No justice, no peace, no racist police!” as well as “Black lives matter!” They then took to the streets of lower Manhattan and blocked traffic for at least another hour. “Callously called ‘Thank you NYPD,’ this provocative demonstration is insulting and disrespectful to families who have lost loved ones to police murders and people who have survived police brutality. In fact, also on Dec. 19, at the same time, only blocks away from this pro-police brutality rally, the family of 18-year-old Ramarley Graham — murdered in his Bronx home by NYPD Officer Richard Haste on Feb. 2, 2012 — will be holding a rally to demand that the Department of Justice convene a grand jury hearing for his case. “We believe this pro-police demonstration is cause of great concern to millions of people across the country who have been in the streets protesting against racism, white supremacy and police violence. After all, it is not police officers who are shot down every 28 hours in the U.S. But this alarming statistic is the daily reality for Black people in the United States. “We believe this pro-police brutality mobilization is a dangerous threat to communities of color already under attack due to police occupation. We see this mobilization of largely armed off-duty and plainclothes police and their supporters as an effort to whip up violence against people who have peacefully mobilized in the streets for the past several months all across the country.” To read the entire statement, go to peoplespower.net. Demonstrators in downtown Buffalo, N.Y., defied bitter cold to deliver anti-racist demands to the Department of Justice on Dec. 19. They then marched to a rally at City Hall, to the County Holding Center (jail), and finally took their protest to police headquarters. In the process they held up rush-hour traffic at a main highway intersection. This “Black Lives Matter” event was initiated by the Buffalo AntiRacist Coalition. A number of lawyers and their supporters staged a die-in Dec. 17 inside the Philadelphia Criminal Justice Center in solidarity with Michael Brown, Eric Garner and other victims of police killings. Afterwards, eighth-grade African-American students from Sankofa Freedom Academy held their own die-in outside the injustice center. The protests ended two blocks away with another die-in at the hated statue of Frank Rizzo, infamous for his brutally racist treatment of Black community members during his terms as police commissioner (1968-1971) and mayor (1972-1980). The Ferguson to Philly Emergency Response Network (#Ferguson PHL) held its second town hall meeting Dec. 16 at Calvary Church in west Philadelphia. More than 400 people turned up for what became a second Peoples Power Assembly. The meeting, larger than the one held Dec. 2 immediately after the verdict from Ferguson was announced, was a serious planning and coordinating vehicle for upcoming protests and beyond. It is impossible to list the many upcoming protests announced at the meeting. Of note was the enthusiasm to have more community-based events. The gathering was attended by students from area colleges who have provided leadership roles in Ferguson and New York response actions. Lawyers holding the Dec. 17 die-in stopped by to announce their plans. Members of the Philadelphia Student Union also announced a die-in for Dec. 18 outside the next School Reform Commission hearing. A key proposal was a call for a Martin Luther King Jr. Day of Action, Resistance and Empowerment (#) with a citywide, if not regional, march and rally to reclaim King’s legacy of resistance and struggle. In Atlanta on Dec. 15, more than 125 people gathered at Underground Atlanta and marched on Peachtree Street behind letters in lights spelling out “Black Lives Matter.” Upon reaching the Fox Theater, a die-in was held in front of an expansive entryway where a holiday concert featuring Christian music singer, Amy Grant, brought out a largely white suburban audience. The protesters repeated the last words of Eric Garner, “I can’t breathe,” 11 times. With a front row of demonstrators holding the illuminated letters, the theater was blockaded for more than a half hour. Police cars with blue lights flashing shut down traffic on the city’s main corridor. The largely youthful crowd took all lanes on Peachtree Street as they marched back to their starting point. One of their chants was “We’re young, we’re strong, we can march all night long!” The demonstration was organized by the Gen Y Project and supported by many other groups, including Workers World Party and the International Action Center. An anti-racist demonstration was held in Royal Oak, Mich., a majority-white suburb outside Detroit, on Dec. 19. An African-American woman had been chased by a white motorist after being falsely accused of a home invasion. She happened to be at the wrong address and did not enter the property. After flagging down the Royal Oak police, the woman was treated as a criminal but later released. Demonstrators from the Michigan Emergency Committee Against War & Injustice, the Moratorium NOW! Coalition, the Detroit chapter of the National Lawyers Guild and others picketed outside the Royal Oak Police Department. Demonstrators said the situation could have resulted in a Renisha McBride scenario. McBride, just 19, was shot and killed by homeowner Theodore Wafer in 2013 after she knocked on his door in Dearborn Heights, Mich., seeking help after an auto accident. Wafer said he thought she was an intruder. A jury convicted and sentenced Wafer for second-degree murder. When Royal Oak Chief of Police Corrigan P. O’Donohue and the city manager showed up, they told demonstrators no racial profiling was involved. They left after protesters did not accept their explanations. In Madison and Milwaukee, Wis., hundreds of Black and Brown youth and their allies have taken part in die-ins, protests at jails and street protests. Wisconsin resembles an apartheid state for those of African descent, having the highest incarceration rate of Blacks in the U.S. and numerous murders of Black people by police. On Dec. 14, hundreds of students marched, chanting, “Finals on your mind, Black lives on mine!” at University of Wisconsin-Madison and staged a die-in at the undergraduate library. In Milwaukee a die-in took place at Marquette University on Dec. 8. The next day, protesters staged a rally and die-in in front of District Attorney John Chisholm’s house to demand he charge Christopher Manney, the cop who killed Dontre Hamilton on April 30. “The blood is at the doorsteps of the district attorney’s office,” said Nate Hamilton, Dontre’s brother, as he and supporters lay in the street in front of Chisholm’s home. The Coalition for Justice sponsored a rally Dec. 9 at Red Arrow Park, the site of Hamilton’s murder. Protesters faced off against dozens of police and occupied City Hall for hours, demanding that Mayor Tom Barrett meet with the Hamilton family, which he did the next day. As part of the national day of actions, the coalition sponsored another rally Dec. 13 at Red Arrow Park. A “People of Faith Standing Together” rally at Red Arrow Park and a protest at the police “Safety Building” took place Dec. 14. For information about ongoing protests in Wisconsin, visit “justicefordontre” on Facebook and wibailoutpeople.org. The Oakland, Calif., Police Department was surrounded and locked down on Dec. 15 in the middle of rush-hour traffic. Protesters — organized by the Blackout Collective, Black Lives Matter and Black Brunch — had locked themselves across the OPD front doors and across the 7th Street and Broadway intersection at the north side of the OPD, and blocked the 6th Street and Broadway intersection and the freeway ramp at the south side of the building. The U.S. flag on the OPD flagpole in front of the building was replaced with a beautiful flag featuring the faces of victims of racist killings: Michael Brown, Eric Garner, Oscar Grant, Renisha McBride and Alex Nieto. All this was accomplished in an atmosphere where for the last several years the OPD has used lines of riot-gear-equipped police to keep any protest march at least a block away from the building. The protesters tried to keep the blockade up for at least four hours and 28 minutes — four hours for the time Michael Brown’s body lay in the street after he was killed and 28 minutes for Black and Brown lives lost every 28 hours to violence at the hands of police and vigilantes, based on a study by the Malcolm X Grassroots Movement. A large number of the protesters were eventually arrested, with many having to be sawed out of the lockdown equipment by the Oakland Fire Department. Most were cited and released. In Seattle, some 400 demonstrators, inspired by the stand of many Black athletes, held a high visibility “Black Lives Matter” protest on Dec. 14 outside the professional football game of the Seattle Seahawks versus San Francisco 49ers. The protest at Century Link Field shook up some of the high-income people going in and attracted a lot of interest. More protests are planned. Abayomi Azikiwe, Ellie Dorritie, Terri Kay, Dianne Mathiowetz, Jim McMahan, Milwaukee WW Bureau, Monica Moorehead, Betsey Piette and Joseph Piette contributed to this roundup. Photos: Monica Moorehead in New York; Abayomi Azikiwe in Michigan; Blackout Collective in Oakland, Calif.; Joseph Piette in Philadelphia; Coalition for Justice in Milwaukee; Ellie Dorritie in Buffalo, N.Y.